This whole wheat chocolate cake recipe is the perfect solution for anyone who wants to make a cake from scratch without spending days in the kitchen or having the end result look like it was decorated by a 4-year-old. Earlier this year my daughter asked me if I could “write” Happy Birthday on top of her homemade cake, and I practically laughed out loud at the thought of what that would look like. 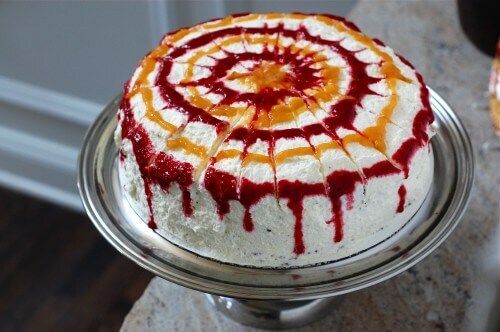 So cake-decorating skills or not…absolutely anyone can make this “tie dye” cake turn out beautifully. And don’t be afraid to switch up the colors. I used peaches and raspberries in the pictured version, but if you want it to be more “boyish” blueberries would add some great color as well. Preheat oven to 325 degrees F. Generously grease two 9-inch round cake pans or other sized baking dish. In a large bowl whisk together dry ingredients including flour, cocoa powder, baking powder, sugar and salt. Make a well (hole) in the middle of the dry ingredients and drop in the water, eggs, oil, and vanilla. Mix by hand with whisk until well blended. Distribute batter evenly into the two cake 9-inch pans and bake for 18 – 20 minutes or until a toothpick inserted into center comes clean. Let cool before adding frosting. 1 ½ recipe berry sauce, with water, reduced in half (subbing either frozen or fresh organic fruit for desired topping color for e.g. raspberries = bright red, peach or mango = orange, blueberries = blue, cherries = dark red). See link below. In a large bowl, whip cream and sugar together using an electric mixer. Meanwhile prepare berry sauce(s) with desired fruit for topping. Let sauce(s) cool. Turn out one of the cooled cake rounds onto serving platter. Cover the top (that used to be the bottom) with whipped cream frosting. Lay second round cake layer directly on top of first frosted cake layer. Now cover the entire exposed cake with frosting including sides. Put berry sauce into a squeeze bottle or alternatively you can try to drizzle sauce onto cake with a spoon. I used a “ketchup-style” squeeze bottle with the tip cut off to make the opening at the top a little wider. 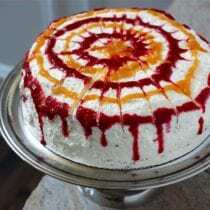 Make colored circles on top of cake using berry sauce (pictured). 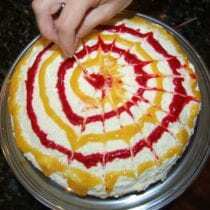 Using toothpicks start in the center of the cake and drag through the sauce to the edge. Repeat until desired look is achieved. For best results serve within a few hours. Keep leftovers refrigerated. Tools needed: squeeze bottle or spoon, and toothpicks. Previous Post: « FREE Summer “Real Food” Meal Plan! So yummy! I made this into cupcakes for my daughter’s first birthday and they were amazing! (I tried 4 or 5 others in the process and this was definitely the best). Just mixed this up and popped it in the Oven. My Husbands Birthday is next weekend and he loves chocolate cake with Peanut butter icing. So i am doing a trial run with the cake. It smells amazing! Thanks for the recipe! I made this cake for my husband’s birthday and it was delicious. The recipe made a lot of whipped cream so I think next time I would only use two cups of the cream. I made this cake for my Hubby’s birthday and it was a HUGE hit! Thank you. This was a great recipe, really easy to follow, and my kitchen smelled heavenly when the cakes came out of the over. The only problem was when I went to make the frosting – I used two cups (not three) of heavy cream, and three tablespoons of sugar, but what I got after brisk hand whisking was not frosting but a very liquidy material – not really sure what to call it. I “poured” it over the cake, covering all sides and the layer in between and have now put it in the fridge hoping it will “solidify” in the cold. Can anyone tell me what I did wrong? I used “heavy cream” not “whipping cream” but from looking at other posts, it seems both are the same, so that wasn’t the problem. It’s a great cake so now I just need to perfect the frosting…Thanks! Awesome recipe!!! I also made this for my husband’s birthday dinner!! I substituted the sugar for maple sugar and added agave to the frosting with a touch of vanilla. I also put fresh strawberries in the middle and on the top with sprinkles. This was my first two layer cake and it was easier than I thought!! I want to make a cake for my diabetic brother so he has a dessert to eat this Christmas. Can Coconut Palm sugar be used instead of cane sugar? I know the frosting will come out brown, but that is ok. This was the first from scratch cake I made and it was a huge hit! Thank you so much. I didn’t use the whipped frosting, but I doubled this for my son’s first birthday and did cupcakes as well. No one could believe it was my first from scratch cake. Now making cupcakes again for Christmas. Use WW pastry floor and white ww flour with coconut oil and it’s delicious. The recipe calls for coconut oil. Is it measured in the solid form? I would really like a processed sugar free cake recipe for my daughter’s birthday. Would honey or maple syrup work instead of the sugar? YUMMMY!!! My husband and 3.5 yr old just made this for my b-day, it is sooo good! We used 1/2 the whip cream frosting recipe and did one raspberry sauce and one blueberry sauce. We both agreed this was one of the best cakes we’ve ever had. Super moist and not too sweet or overpowering. The frosting was perfect too! Thanks for a delicious recipe, I couldn’t have found it on a better day! Happy Birthday to me! I made this cake (with your vanilla icing recipe and topped with Unreal peanut butter cups) for my husband’s birthday and it was a hit! We all (we have two sons ages 2 and 6) agreed that this was the best cake we have ever eaten! My 6 yr old is already asking when we can make it again. I will never buy a box cake mix ever again and I will make this cake as often as I can so others can enjoy it too! Thank you so much for sharing all of these wonderful recipes and tips. This is by far one of my favorite blogs! This recipe looks great…. I want to make my son’s 2nd birthday cake in the shape of a 2. Do you think the texture of this cake would cut well? Also, can I make it ahead of time (minus the frosting) and freeze it? We tried this today for my husband’s birthday cake. It is a very moist cake, and the best chocolate cake I have ever eaten. No need for box mix when this can be your treat. Yum! great recipe! the cake was delicious :) thanks! Made this for my son’s second birthday. It was really good and all the guests loved it! The frosting, as others here seem to think too, made way too much, so next time I’d probably halve it. Instead of decorating with the berry sauce we just had it in a bowl for guests to pour on top. It was so delicious. 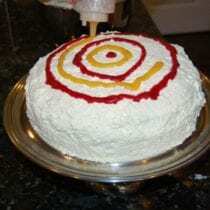 Could you make this but eliminate the cocoa to make yellow cake? This recipe doesn’t have as many steps as the yellow cake recipe on this site….. I tried making it without cocoa. The batter was too moist so I added 1/2 cup white flour & then it seemed right. This made 24 cupcakes. They are really moist & light. Without frosting they taste like sweet plain muffins but with frosting they taste more like cup cakes. I made brownies using coconut oil and it had quite a strong coconut taste. Can this be lessened by liquifying the oil? I don’t like the flavor of coconut. Can you use this recipe to make cupcakes? Any changes in baking temperature and/or time? I have made these into cupcakes in the past and again today for my daughter’s birthday. They turned out great! I didn’t alter the recipe at all. I just kept an eye on them as far as cook time. I think today they took about 15 minutes. I had many compliments. Thank you for the great recipe! Hi, can this be made into a 9 X 13 size cake? How long would you cook it for? Hi,I am wondering if I could replace the sugar with honey. My diet does not allow me to have sugar. Thanks. I made this with strong coffee instead of water and 1/4 coco and used a mascarpone frosting, perfect ‘tiramisu’ cake! was mixing it separated and became clumpy and not good. Is it because I used cane sugar instead of the refined stuff? I have a similar recipe that I use quite often but this decorating idea will spice it up for a change. @Paulette: only mix until the cream is “stiff”. If you mix too long it’ll turn into butter chunks swimming in butter milk. You might want to edit the recipe to say (for the newbies like me that don’t know…) that you have to whip the cream and sugar on HIGH to get anywhere. I tried every speed on my mixer for about 10 minutes, except super, blown-out, all the way, high and all I had was a soupy mess. I finally thought I’d give high a try before I threw it out and it finally started to firm up. (And then it was perfect!) Might seem common place to people who bake, but I had no idea and I saw several comments from others that didn’t either. This has become our go to recipe for birthday cakes. My kids both love it, and several months ago my daughter asked for this cake with strawberries we picked. We put some in the freezer and I defrosted and drained them. I mashed them and put them in the middle, and used the extra strawberry juice to color the frosting (I actually use frosting from the cupcake recipe on this blog, but only half because it’s so sweet for us). The extra strawberry flavor was really delicious and it made my birthday girl very happy! One note for those trying this recipe for the first time, make sure you really grease those cake pans, and then allow them to cool about 30 minutes to get them out easily. Is there really 2 Tablespoons of Vanilla in this cake recipe? Just asking because it seems like a lot. Thank you & I love your book!!! My family loves this cake. Can this cake recipe be used to make cupcakes too? Hi there. It can. Bake at the same temp and regular size cupcakes are usually cooked within 15-20 minutes. This sounds so good! I want to make it for a small birthday celebration. Could I half recipe and just use one 9″ cake pan? Thanks!! Made this this weekend for my son’s 2nd birthday. Loved it! I did use 1 cup white whole wheat and 1 cup whole wheat pastry flour. It came out kind of dense so next time I will use all pastry flour. This is my go to recipe for chocolate cake now! Any recommendations for a good egg substitute for this recipe? Flax is our go-to usually. Will that work? Hi Neal. Other readers have used flax in this recipe. Can I use 1 c of white whole wheat instead of 1 c whole wheat flour? What I do when I don’t want to use white instead of wholemeal flour is add 20% ground oats or 10% ground flax. That way I’m replacing the good I’m losing from the wholemeal with something as good or better. Oats do change the texture though, and generally make something denser. Flax generally keeps things light. I’m not a baker but want to use this recipe for cup cakes for my daughter’s 2nd birthday next week. Can I frost the cup cakes the day before, will the frosting he up? Hi Cara. I would wait until the day of to frost them. Can I cut this recipie in half for a smaller cake? Hi Meghan. We have not tried but some cake recipes might need a bit of adjustment when cut in half. There are numerous threads on various baking/cooking forums. This might help: http://chowhound.chow.com/topics/440559. Right now I’m on whole wheat, no sugar diet. This is the only recipe for chocolate cake that I was able to find that used any whole wheat flour! Do you have any idea how this would taste fully whole wheat and with a sugar substitute? Hi Anna. Sorry, we have not tried any substitutes for sugar in this recipe. Do you know if this recipe would need to have any high altitude adjustments? Hi Cara. Not sure but this might help: http://www.kingarthurflour.com/learn/high-altitude-baking.html. Hi. Sorry, we can rarely answer in real time. The 2 T is correct. How can i make the frosting into chocolate frosting? Just add some cocoa powder? Hi Sarah. We’ve not tried that. Let us know if you give it a go. We absolutely love this cake! I would love to use this recipe for cupcakes – can you give me an idea on baking time? Thanks! I made cupcakes and I cooked them for 20 minutes. How many cupcakes came out of one batch of cake? So wonderful ! Used brown sugar instead, my 14 year old daughter made the cake, the whipped cream frosting and a cherry berry sauce. All 12 kids and 4 adults loved it for Daddy’s birthday ! What could I use as a sugar substitute? 1.25 cups seems like a lot. I am wanting to make my son’s first birthday cake. Could I use sweet potato or? Any other ideas? Hi. We’ve not tried adapting this recipe. I am going to attempt to make it with coconut sugar – which is lower on the glycemic scale – and I am going to drop it to 3/4 cups. I always use half the amount of sugar suggested. Used olive oil and even added 2 heaped tablespoons of ground flaxseed. Kids loved it and no complaints on the flaxseed. This cake is delicious. There is no way to tell that it is mostly whole grain! We ate it without the whipped cream on top and it was fantastic. Obviously, the whipped cream would be amazing, but we couldn’t wait that long! :) It was a lovely texture and is nice and moist throughout. We baked it in one 9×11 rectangle pan for 22 minutes. The oven temperature is wrong on this cake! What should it be? ?